Crew member scheduling app for theatre companies. Is there a better alternative to CompanyMOVE ShowPlanner? Is CompanyMOVE ShowPlanner really the best app in Applications category? Will CompanyMOVE ShowPlanner work good on macOS 10.13.4? 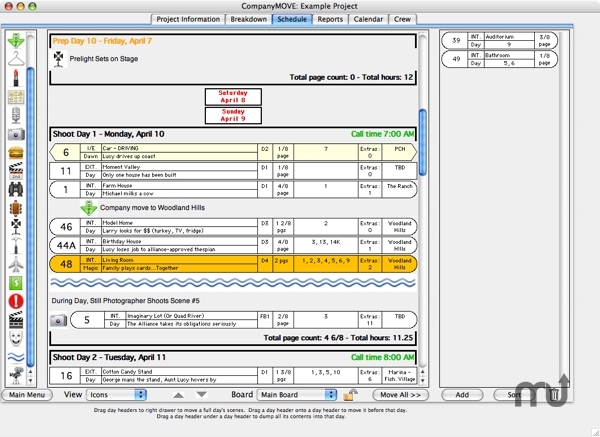 CompanyMOVE ShowPlanner provides a better way for all crew members to breakdown scripts and schedule films, television shows, commercials and videos. Schedules integrated with call sheets and production reports to eliminate daily redundant typing. Visually superior graphics, using icons and a variety of shapes and colors to better communicate what's being shot when. A robust calendar that allows you to also schedule prep and post. New features like "Cast BlackOut", which lets you mark days cast are unavailable and "TimeOut", which allows you to track how many hours each scene will take. Multiple Strip Dragging. Users can now drag, drop and delete groups of strips from within the schedule window by control clicking on the strips you want to move. You can also still choose to use the single-strip method, which does not require control clicking to activate. CompanyMOVE ShowPlanner needs a review. Be the first to review this app and get the discussion started! CompanyMOVE ShowPlanner needs a rating. Be the first to rate this app and get the discussion started! A relentless commitment to regular improvement, with frequent free upgrades. Location Reports with Mapquest and Google Map Integration. Another CompanyMOVE first! Perfect for tech scouts, this feature lets you map out every one of your locations along with a sheet that helps you track all needed logistics for that location. Customizable Commercial Strips. You can now choose where the different information fields display on the commercial strips using the same easy pull down system we introduced for our regular strips. Simply visit the bottom of a project´s PREFERENCES page to set it up. There is now an UNUSED tab on the SCHEDULE screen, for scenes that you do not want to delete, but may have been omitted from the script or are currently only tentative. Scenes placed in this section don´t show up in any reports or schedules. This also enables you to better use the TBD section, which can be printed out as an addendum to the schedule and can be renamed to indicate anything from "2nd Unit work" to "VFX" to, well, "TBD." Locations can now be linked to sets, to speed up script breakdown. On the call sheet, characters not working (being held) will now display properly. Also, characters can be modified to display as being held or not held in the category reports and call sheets. Perfect for Stuntpeople and other cast that are not necessarily held on off days. Strips can be now be automatically printed in scene ascending order without having to specially reorder them . More preferences can be set on a project-by-project basis. When locking the schedule, asterisks now mark changes on the right side of the strips. You can choose to not print out page count totals for commercial reports. Various other technical and aesthetic improvements.